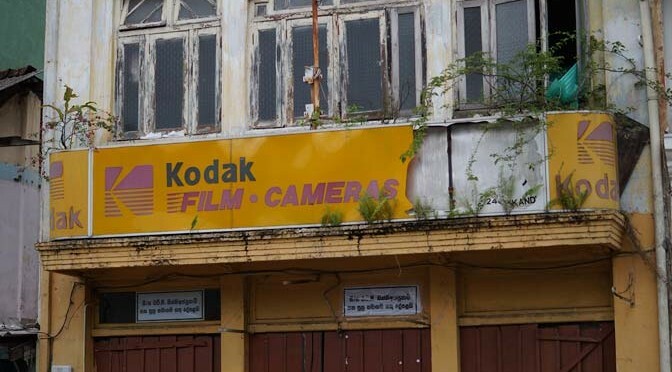 I love Southeast Asia. Each country is a whole different experience. Everyday is it’s own unique adventure. Traveling around this part of the world has introduced us to all new things. It has been an incredible journey, where we now have become almost immune to noticing much at all. The never ending stares, un-named foreign foods, giant bugs, and crazy heat and humidity is becoming all too normal now. We just left the amazingly beautiful country of Indonesia, with a new puzzle floating around in my head. It was something different, something we have not yet experienced in our travels, and something I still find a bit odd. 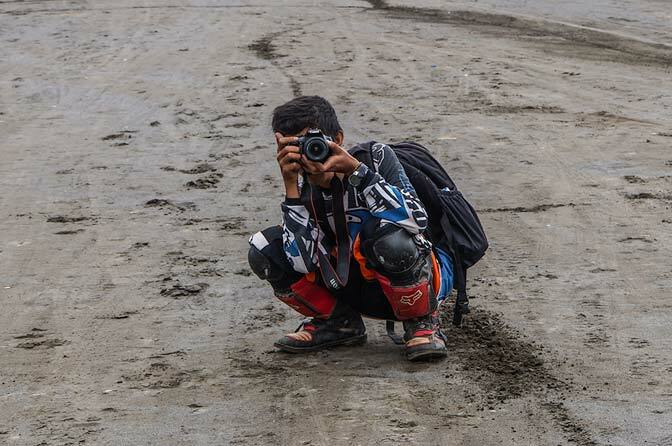 The one quirk that I have tried to understand, but still cannot comprehend is the seemingly large obsession of Indonesians with taking photos. To be more specific, photos with white people in them. Photos with strangers. I do not know how many hundreds of pictures are floating around that we happen to be in. 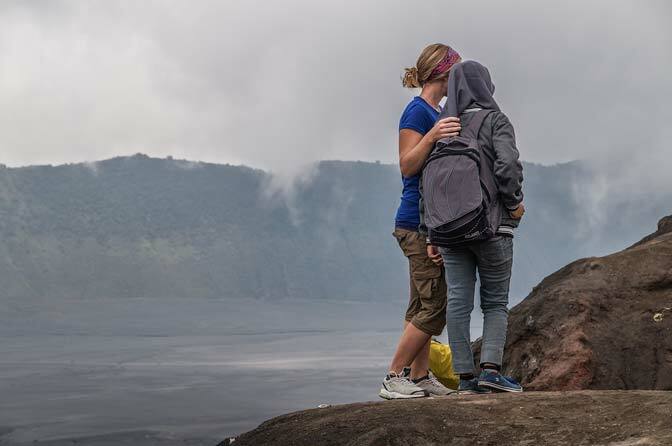 It started in the airport upon arrival in Indonesia, and continued on the bus, walking the streets, eating, touring famous sites, in stores, sitting, standing, in the bathroom, in lines waiting, it didn’t matter as it was a constant thing. Picture with an Indonesian family on top of Mt. Bromo. If we were not asked to be in a photo, then we would hear clicking cameras or phones as we would walk by. No shame was shown when I would look over and see people clicking away, at us, the only two white people around. I found Indonesians to be some of the nicest people. This could be part of the reason why we had troubles saying no to taking photos with these newly met strangers. I was happy to oblige with all the photo requests at first, thinking perhaps they haven’t seen many white people before. One of the fifty pictures we were asked to be in at the Borobudur temple. It wasn’t until we were in bigger cities, with a larger diversity, that I realized my previous reasoning didn’t compute. The tricky part to agreeing to be in a photo is that it isn’t just one photo. 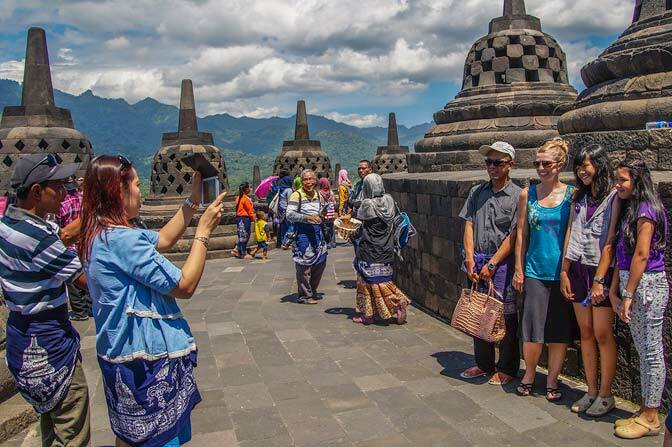 Each Indonesian would take turns being in the photo and taking the photo, making sure they each had one of themselves and us. Indonesians taking turns being in the photo, and then taking the photo. Once we agreed to the photo and were stopped, others found this to be the perfect opportunity to ask for their photos to be taken as well, and a serious line would then form. It was one of the most bizarre things, and I still have not wrapped my mind around it. My confusion is still lingering. 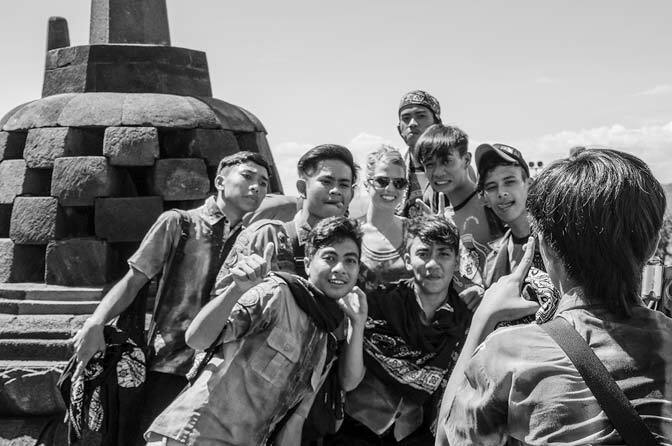 Swarmed by high school boys at Borobudur temple. Either way, this was a good self-esteem booster, when people desired photos with us. Traveling around the tropics, hovering over the equator, dripping sweat, clothes damp, showering when we could, hair out of control, not a lick of makeup for months, and my trusty razor rarely touched, didn’t seem to deter anyone from asking. Why wasn’t Thad in the picture with all the young men???? Hi, we're Thad and Laura, a married couple from Denver, CO. We took a 14-month trip around the world, ending in April, 2015. This site has stories, photos, and video of our travel experiences. We hope you enjoy it and we hope it inspires you to travel!